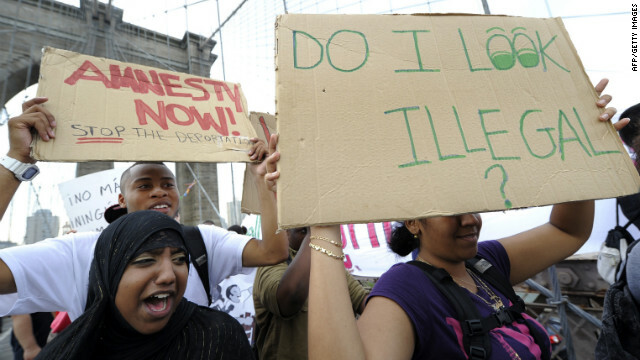 A coalition of immigrant groups and their supporters march across the Brooklyn Bridge in New York in July 2010. Editor's note: How does this affect you? Share with us on CNN iReport. (CNN) - Jose Luis Zelaya shed tears of joy Friday morning. "It's just insane," the graduate student at Texas A&M University said. "I've been working on this for six years. It is just overwhelming." Zelaya was electrified by news that the Obama administration will stop deporting illegal immigrants who entered the United States as children if they meet certain requirements. Zelaya came to the United States illegally from Honduras at age 14 to find his mother, who was already in the country, he said. Without the change announced Friday, he couldn't get a job to help pay for school; Zelaya, 25, is pursuing a master's degree in education with hopes of earning a doctorate and teaching middle school. He also wouldn't be able to consider job offers that presented themselves afterward. The uncertainty over what loomed after graduation spooked him. "Now, maybe I will be able to work without being afraid that someone may deport me," he said. "There is no fear anymore." News of the change raced across the country, buoying the spirits of immigrants and immigrant advocates who have campaigned for such a change for more than 10 years.